In school, you might have learned about “My Plate”, which is similar to the food pyramid, and tells us the amount of food in each category we are supposed to eat each day like you see in the picture. Today we are going to talk about how honeybees help get that food to our plate. Did you know that unlike most insects, honeybees are fuzzy? They have little hairs all over their bodies--even on their eyes! When honeybees fly away from their hive, they go to flowers to collect nectar, but while they are collecting nectar, they are also doing something else that is very important: pollination. You can tell how fuzzy honeybees truly are from this picture! 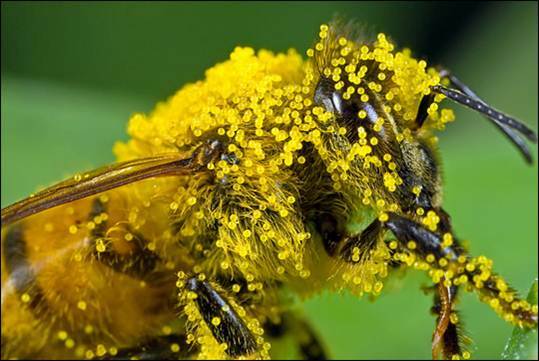 Pollen from the flower that the honeybee visits sticks to the little hairs all over the honeybee’s body through static electricity. Have you ever rubbed a balloon on your head and then stuck it to a wall? The pollen sticks to the honeybee in almost the same way. A honeybee may fly to over 100 flowers on one trip, so the pollen from the first flower gets moved to the next flower, and the pollen from that flower gets moved to the next one, and so on. When the honeybee pollinates a flower, it allows that flower to make a seed. tell it was pollinated because of the seeds! 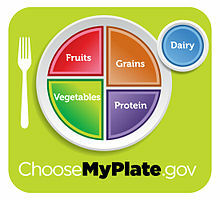 According to MyPlate, HALF of what we are supposed to eat every day is fruits and vegetables! 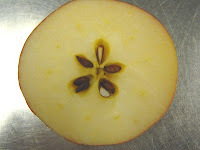 What kinds of fruits and vegetables do you eat that have seeds? Apples? Oranges? Cucumbers? Pumpkins? Watermelon? I bet you can think of many more! Honeybees pollinate many of our fruits and vegetables, and so they already help fill about half of our plate. grains. Although the wind pollinates many of the grain crops, honeybees are still important for some. 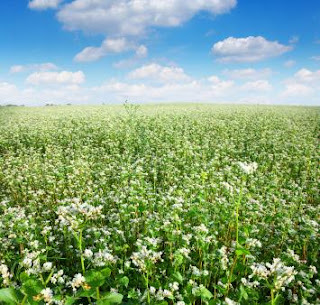 One type of wheat that honeybees pollinate is buckwheat. 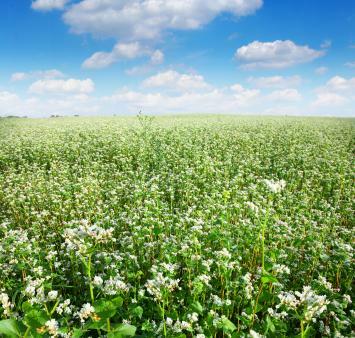 Buckwheat is often used to make pancakes! If we didn’t have honeybees we would be missing some grains! The last quarter of our plate is protein; nuts, beans, and meat make up this section of our plate. Did you know that honeybees pollinate many of these foods too? Over 1 million hives each year go to California to pollinate almonds, one type of nut. Honeybees also help pollinate different beans like lima and kidney beans. Honeybees even make it possible for us to have meat and dairy products because honeybees pollinate alfalfa, which is a food that cows and other animals eat! As you can see, honeybees pollinate many of the foods that help us fill up our plate. One out of every three bites of food we eat is pollinated by the honeybee!